June was wet. It rained prolifically on the Salt Lake Games. The following weekend I marched for the first time playing bagpipes in the Utah Gay Pride Parade. It rained cats and dogs at that parade, too! The organizers of Utah Pride had never had bagpipers and I always thought that the parade could use some (couldn’t all parades?) I put the word out but, this being Utah, most pipers were reticent about attaching themselves to anything having to do with gay rights. Still, one other piper (who is out and open about it) joined me. We played for the interfaith church service, the march from the church to a rally at the Salt Lake federal building and then the following morning for the parade itself. The parade was intense; despite the rain, the crowds turned out in huge numbers and it was like marching through a tunnel of people. Afterwards we got a lot of very positive comments – we will surely be doing it again next year, and perhaps we can gather more pipers and some drummers. I think when pipers realize the sky won’t split open and strike them down, or that they won’t be “turned gay” by marching in a Pride Parade, they’ll begin to warm to the idea! I liked the peculiar irony of marching that Saturday morning in the Eagle Mountain parade (possibly Utah’s most conservative town) and then driving straight to play for the pride events that afternoon. In July, the Wasatch and District Grade 4 band had its second competition. We took second place! We knew we had improved, but this was still a surprise to us. You can see our performance here: At the end of July we traveled to the Enumclaw games near Seattle. Up there we compete against the overachieving canadian bands, so we couldn’t repeat our second place! Still, it was a good experience. Also during July (on the 4th, actually) I marched in a parade in the morning and then drove 4 hours to central Utah to play for a funeral. That was a long day! In August, the World Pipe Band Championships take place in Glasgow. Two of my band members joined the Grade 1 band Triumph Street this year and went over to Scotland to compete. What made the competition even more compelling was the live feed provided by the BBC this year. I got up super early (2am) to watch the qualifying rounds and then the finals. A fellow Utah piper (John Miner) did the same and we compared notes by Facebook chat as the competition progressed. Triumph Street qualified for the afternoon finals and it was very exciting to see my friends Justin and Ross broadcast on worldwide TV as they played a wonderful couple of sets with their new band. They’re back now, and ready to help Wasatch and District again during the off-season. September has been a quieter month. My band traveled to a Highland Games in Colorado at Estes Park as the duty band. I wasn’t able to attend but it was a very successful trip and the band got a lot of praise for its professionalism. I started a new full time job in late August, so my mid-weekly piping gigs are now a thing of the past. At our band AGM we confirmed that we plan to travel to Scotland ourselves (to compete at the Worlds) in 2011, so exciting times are ahead. Next week we begin rehearsing our new music for 2010. Our Grade 4 band will add a Timed Medley this coming year, and it’s going to be good! I’ll update you all as we get to grips with it! I Look to the Heathens – is this a Sign? 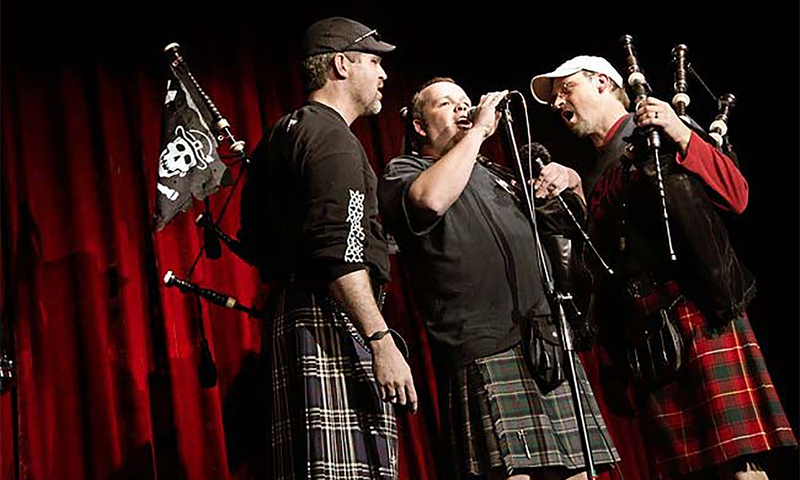 Just what the Salt Lake area needs as an antidote to missionary-attire pipe bands – a group of heathens playing pipes! I’ve been aware of the existence of the Heathen Highlanders for a few years now – I saw them billed on an Irish Dance concert poster in 2006, and I always thought I should consider joining them. I never did a thing about it but, as Colby and Justin (a couple of my good piping friends) jumped in and seemed to do OK, I decided now was the time. It turns out they are a trusting bunch. They have accepted me as a member without actually having heard me play! I have no doubt I can play the tunes and join the flow of their particular brand of piping, but they don’t know that, and they’ve booked me to play with them on live TV next Wednesday morning. They (or we) will be playing for a local TV station’s St. Patrick’s Day morning show, live from Piper Down, an Irish pub in Salt Lake. I’ve played in an English pub, but never an Irish one, so this should be interesting. I have also never played a St.Patrick’s Day show. My old band came up with the “50 degree” rule; they would not play if the temperature was lower. The sole purpose of this rule was not to spare the pipers’ fingers, rather it was to provide an institutional reason NOT to play the St. Patrick’s Day parade in Buffalo, New York. Since the temperature rarely exceeds freezing in mid-March in Buffalo, the band was guaranteed never to have to play. Several years of having beer cans thrown at them by drunken Buffalonians had proved to be the tipping point in this case. Well, this gig will be indoors, and we shall see if a party in Salt Lake City is any less drunken in this epicenter of institutionalized abstention from alcohol. I’ve played for prominent members of the LDS Church. With this new move in my piping, I will have covered the range from sublime to ridiculous. You decide which is which! Last night my band, the Wasatch and District Pipe Band played its annual fund-raising concert. Our usual MC, Jeff Mann, was unable to be present, since he had to travel to California for meetings connected with ANAPBA (the Alliance of North American Pipe Bands Associations), of which he is currently Chair. Someone in the band (don’t remember who) suggested I replace Jeff. I’m assuming this is because of my affable manner and cool British accent, not because I’m the most dispensable piper in the band. Anyway, the evening seemed to go pretty well and, although I felt fairly wooden in places, people said nice things about my hosting abilities after it was all over. I join interesting pipe bands. Because I am a member of a band with close connections to the Church of Jesus Christ of Latter-day Saints (the LDS or Mormon Church, to those of you unfamiliar with Utah culture), I will be ringing in the New Year tonight at the former Hotel Utah, now known as the Joseph Smith Memorial Building. This is part of an evening of entertainment provided by the LDS church in downtown Salt Lake City. Although I am not a church member, I reap the benefits of church association with this band. This past Veterans’ Day we played with the Mormon Tabernacle Choir at a televised broadcast of its weekly show “Music and the Spoken Word”. The gig tonight takes place in the opulent surroundings of the former hotel’s palatial lobby. There is a huge atrium with a four-sided balcony. It’s going to be packed, and should be a great gig. As fun as the action in Utah will be, it is eclipsed by the gig my old band, the Celtic Spirit Pipe Band of Buffalo, New York will be playing tomorrow. They have been asked to play the teams onto the ice at the NHL Winter Classic, an outdoor hockey game to be played in front of 70,000+ people at the Buffalo Bills’ stadium. The game is to be broadcast by NBC and will be watched by millions. The weather is forecast to be around freezing with 10-20 mph winds and perhaps some light snow. The band will have to march onto the ice wearing little chains over their shoes. Good luck to you all in Buffalo – I wish I could hop a flight after the Utah gig and join you tomorrow! The games season is in full swing in the Scottish Highlands, and that means lots of piping! Two of the biggest competitions in the solo piping year happen at games a week apart: The Argyllshire Gathering, in Oban, took place last week, and The Northern Meeting, in Aviemore, is this Thursday and Friday. Richard Hawke of New Zealand took the Gold Medal in Piobaireachd, a first for him. This signifies a graduation of sorts, for once a piper has won this medal, they will play only in the Senior Piobaireachd in the future. (That competition was won by the evergreen Gordon Walker, incidentally). For a limited time you can hear Richard’s winning performance of Rory MacLoude’s Lament, by listening to Radio Planet Pipe. You will also hear the second- and third-placed performances (both of Lachlan MacNeill Campbell of Kintarbert’s Fancy) played first by Niall Stewart, and then by Marion Horsburgh. Marion is also from New Zealand, so it was a good day for the Kiwis. It is interesting to hear the same tune played on the same day, for the same judge, by two different people. Listening to them back to back can you tell the difference between the two? Check out the full results on Andrew Berthoff’s Pipes|Drums, and look out for the results of the Northern Meeting soon. May 27th is Macfie Day, in recognition of that date in 1981, when the reorganized clan was formally recognized as an active clan once again, by The Lord Lyon King of Arms in Edinburgh. I have celebrated the month by making two new Macfie contacts, both of them piping-related. First up, Barry Johnson of Oregon. He began playing the bagpipes after attending the big 1993 Clan Macfie reunion gathering on Colonsay with his wife, a Cathey. Clearly, he never looked back and now he leads a small band called The Caledonians. If you live in the Pacific Northwest, check them out at a Highland Games near you. If you’re not close, then check out some of their performances on their MySpace site. Barry encouraged me to persist in my efforts (mentioned in a previous post) to contact the Clan Macfie piper, Bob McFie. These efforts paid off during May – I finally made contact. Bob is a really interesting guy, and very well connected in the world of piping. He teaches at the College of Piping, in Glasgow and is also active in Europe (especially Germany) helping pipe bands over there. He tells me he has a big collection of Macfie-related music, some of which he wrote himself, and which he has promised to share with me once he get his computer working again! The tune he wrote for the 1993 Gathering is called The Homecoming, and it looks like I’ll be able to try playing it before too long. Still, The Homecoming will have to take a back seat to The Lament for Captain MacDougall for now. 11 days until the Salt Lake Highland Games!